Greg Kintzele is a amiable, blonde seventh-grader from Denver who was always close with his grandmother. They would hike together in the mountains in Colorado where they live, and play a lot of games, too. Especially Scrabble. "She'd always come up with all these words and I'd be like, 'Is that a word?' and then she'd be like, 'Oh yes it is. You can check it in the dictionary," Greg says. And usually she was right. Then he noticed his grandmother starting to change. Her mood became sharper and she couldn't seem to remember the grandson she'd known for a decade. "I felt kind of hurt," he says. "I've known her since I was a baby," but now he says she asks him what his name is. It wasn't until Greg started learning about Alzheimer's disease in science class that the changes he saw in his grandmother started making sense. "Oh, this explains a lot!" he thought. Greg goes to a private school in Denver, Graland Country Day School, which has developed a multi-subject curriculum for seventh-graders focused around dementia and Alzheimer's disease, in part because the disease is widespread in the U.S.
One in three seniors dies with Alzheimer's or another dementia, and it can be confusing to younger generations who may not understand what's happening to their grandparents. In science class at Graland students learn about the history of the disease, genetic mutations and biochemical changes in the brain. They learn about different medicines and how research is progressing to a cure. In English class students write a biography of an elderly person in their lives. And in art, they build memory boxes filled with objects representing that same person's life. "Our goal here is intergenerational learning," says Mark Gatlin, Greg's science teacher. Part of the project takes its young students out of the classroom to interact with adults affected by the disease. A short walk from the school is the Sunrise Senior Living facility, the third floor of the building is just for residents with dementia. That's where Greg politely introduces himself to Jerry Shafer, a resident. They talk about Shafer's past, what he liked to do when he was a boy. Greg asks Shafer what war he served in and he's quiet for a moment. "The Korean War?" asks Greg. "My grandfather was in the Korean War, too." Shafer's stories meander – going far back into his childhood and then to the war, but that doesn't faze Greg. The students here learn to roll with the topics. One resident talks about her days skiing in Oklahoma City and another remembers when band members from Earth, Wind and Fire used to annoy her by playing music too loudly in her neighborhood. Mark Gatlin, Greg's teacher, says not only are the students coaxing memories out of seniors, the kids are also learning complex social skills. "The hardest thing is teaching patience," he says. "They want immediate feedback and going to Sunrise takes them out of their comfort zone." There's little research in the practice of intergenerational learning between adolescents and older people in the United States, but it's more common in Europe. In England, hundreds of schools are termed dementia-friendly, giving students a deeper understanding of dementia and providing interaction between people with dementia and students. 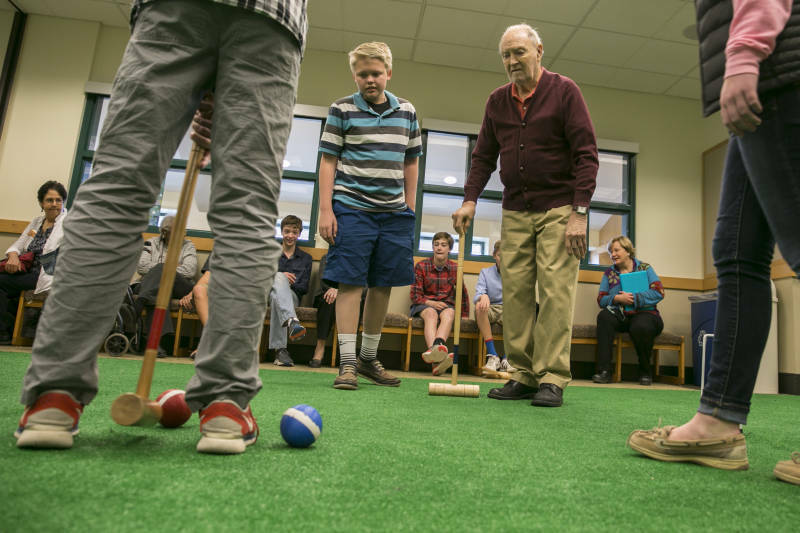 These same skills – being patient and gentle with seniors – are put to work a couple of days later at the school on a makeshift croquet field. About once a month, some of the seniors come over to the school to play. There's a lot of laughter on the green today. One man, though, Bill Taylor, hasn't cracked a smile yet. Then he hits an incredible shot, square on the ball. The room erupts. Taylor smiles a big smile at Greg, his student mentor. "That was amazing," Greg shouts. For him, learning about Alzheimer's this deeply has helped him relate to his own grandmother. He says he's learned not to get so frustrated with her questions and moods. And after talking with the residents at all stages of the disease at Sunrise Senior Living center, he knows what to expect as she progresses. "It's kind of like a map for me," he says. He still plays Scrabble with his grandmother — though now her words are made up. But he says he's okay with that. Copyright 2016 Colorado Public Radio. To see more, visit Colorado Public Radio.